Dhaka – Durga Puja, the largest religious festival of Hindu community, has begun Friday across Bangladesh amid enthusiasm, organizers said. A total of 29,395 pandals have been erected across the country to celebrate the five-day fest to be participated by people from all walks of life. Two hundred and twenty-nine mandavs were set up in the capital Dhaka, according to Bangladesh Puja Udjapan Parisahd. The festival started with “Bodhon” of Durga, marking Sashthi at 4pm pm Friday, while it will come to an end with the immersion of the goddess’ idols in water bodies on October 11. To mark the Sashthi, recitation of verses from the Chandi, blowing of conch shells and beating of drums at temples and pandals begun this morning. 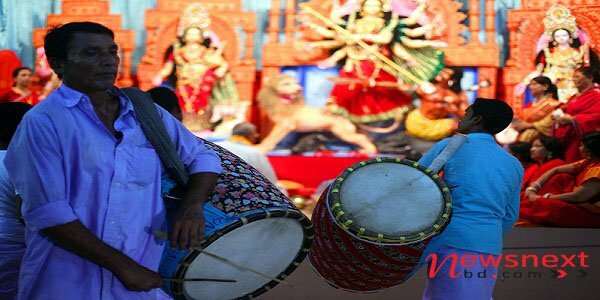 The Maha Saptami will be celebrated Ssaturday; Maha Ashtami, Kumari Puja and Sandhi Puja on Sunday; Maha Nabami Puja on Monday and Bijoya Dashami on Tuesday. President Abdul Hamid and Prime Minister Sheikh Hasina conveyed greetings to the members of the Hindu community. Security measures have been beefed up at temples and pandals with deployment of additional squads of Ansar, police, Rapid Action Battalion and other law enforcement agencies for peaceful celebration of the festival. The government has already distributed rice under the general relief programme among the puja mandav authorities to assist the Hindu community people celebrating their religious festival.